Well, thatâ€™s actually a complicated assertion since the holders of 2k do not appear to be trustworthy people from the perspective of 2kâ€™s critics. Let me explain. Are we to understand from this that Christ only rules the Church directly, by his Spirit and Word? And that He rules everything that is non-church (or the whole of culture itself) through an undefined work of His Spirit in general revelation and through the consciences of the unenlightened people of Romans 2:15? Is this the second kingdom of light? Incredible. . . .
Like so much in the neo-Calvinist and theonomic schemes, this looks good on the screen and appears to make sense. But itâ€™s a lousy philosophy for living in a world where we have neighbors who not only suppress the truth of general revelation but also canâ€™t begin to fathom the teachings of Scripture apart from the work of the Holy Spirit. I mean, the critics of 2k donâ€™t really intend to suggest, do they, that my unbelieving neighbor can open her curtains and see the glory of God and perceive some elementary principles of justice only if I give her a Bible and she begins to read it? Donâ€™t 2k critics believe that a proper understanding of Scripture can only come from the work of regeneration? In which case, my neighbor will never see Godâ€™s glory until she believes. In which case, the anti-2k complaint against the sufficiency of general revelation goes much deeper than a point about the relationship between the two books of revelation. That deeper level is that unregenerate people cannot be trusted. They donâ€™t have the Bible or the Spirit and so cannot see the truths and order God has revealed in creation or their consciences. One implication of this at the level of everyday life is how Christians can summon up enough trust to venture on to the roads and highways with unbelievers? Will the unregenerate or biblically illiterate see the signs and obey traffic laws? Do Christians go to the public library and expect to find the books placed on the shelves incorrectly because of a disbelieving shelver? How could unbelievers ever pull off such quotidian conduct without interpreting general revelation first through the lens of Scripture? And how could they do this apart from saving faith? At the upper ranges of human existence â€“ those having to do with justice â€“ could Christians ever allow for non-saved police, judges, legislators, governors, or presidents? In fact, doesnâ€™t this way of understanding the relationship between general and special revelation force 2k critics to require a religious test for holding public office? In which case, do 2k critics ever vote for non-Protestant politicians? And do they inquire of Protestant candidates if they have really been saved? Gilbert Tennent wanted accounts of conversion experience from prospective pastors. Now we want them from political candidates? So in an ideal world, where the magistrate did not tolerate blasphemy or idolatry, not only would non-Christians be prevented from worshiping but also from participating in public life. Is this the kind of society that anti-2kers want? This would, of course, be heaven, but havenâ€™t 2k critics heard of the dangers of immanentizing the eschaton? And just to make my complication complete, how do 2k critics deal with those who hold the 2k position? Some of the reception that 2k receives is great distrust. In fact, the distrust heaped upon 2kers seems to exceed that held against politicians in the Democratic Party. One explanation could be that 2kers donâ€™t begin political and cultural reflections with appeals to the Bible. But another could be that 2kers are actually unregenerate. I donâ€™t mean this as a joke. It is a serious matter. And the reverse is just as serious. If I am regenerate, then the 2k position disproves the anti-2k argument because 2k shows that regeneration does not require beginning and ending reflection on the natural order with Scripture. If regenerate people can appeal to general revelation instead of the Bible for understanding some matters of morality and social relations, then how can 2kers be untrustworthy? Obviously, the anti-2k position is that 2kers should not appeal to general revelation without starting with special revelation? But if 2kers are regenerate and therefore, from the anti-2k perspective, trustworthy, they why the distrust? Shouldnâ€™t regeneration make 2kers trustworthy? The easy answer to that riddle is to say 2kers are not regenerate. And that may explain the Gilbert Tennent-like histrionics that so often greet 2k. Dr. Heart, when you wrote: Â«Gilbert Tennent wanted accounts of conversion experience from prospective pastors. Now we want them from political candidates?Â» does that imply that you do not have to have to some extent a conversion history from passing from darkness to light? The ordinary means of grace are the normal means God used to bring people into the kingdom, right? But, who hears the preaching of the Word, partakes in the sacraments, etc…? Normally believers or whatever number of unbelievers might be in a particular church. Beyond that, do the anti 2K believe that other means, like political, vocational, etc. are also means of grace that God thru the Spirit uses to draw sinners to Christ? If so, do those fall under a separate category outside of the authority of the church? Or, might we not just make it the law that requires every citizen (even ilegals?) to attend church each week? That way we can be assured that they will at least here the preaching of the Word and then live it out (I guess) even if they are never effectually called? And, of course, I am assuming that every church would faithfully preach God’s Word. Or, better yet, we could pass a law only allowing faithful churches. When’s the next election again? Sorry, I misspelled illegal and hear. 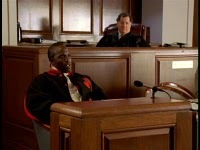 Omar Little on the Old Life blog. Awesome! What is so ironic about this is that neo-Calvinists and theonomists and everyone in between who have a hard time with natural revelation become odd-couples with the dialectical theologians of the 20th century. Barth and those aligned with his theological program rejected natural theology in protest of theological liberalism and to a degree, Catholicism, and in so doing threw the baby (a sensible doctrine of creation) out with the bathwater. Calvin and the theologians who followed has a healthy sense of natural revelation, but somehow that has been lost. The fact of the matter is that conservatives, Reformed or otherwise who reject Natural Theology are more indebted to Enlightenment thought than they care to admit. Before the Enlightenment, Nat. Theo. was a given in Christian theology across its divisions. However, at least as I have come to understand it, after thinkers such as Kant, Hume, Kierkegaard, et. al. Nat. Theo. general revelation, and the like fell out of favor. In stead of fighting the good fight, conservatives acquiesced, conceding to the spirit of the age with this respect. Darwinsim wasn’t altogether helpful either. By the time the 20th century rolls around, almost nobody outside isolated pockets in the Protestant world was defending it, or if they were (in the case of Emil Bruner), it was still within the framework of dialectical theology. What we gave up was a robust doctrine of creation, a sense of shared space in the created world, and certain ecological and sociological obligations as a rule of creation endowed by its Creator. Today’s rank-and-file conservatives (X-ian’s especially) are slaves to these anti NL categories, in addition to these they are more bound to the ideals of Industrialism (and post-industrialism), seeing themselves as consumers instead of citizens and unabashed defenders neo-con politics, which as the dominant form of conservatism in America is absolutely sold out to the commercial agendas of Industry regardless of the harm it unleashed on our environment, our society, or even our churches. Instead of seeing themselves as a part of an inherently good created order, run by principles implicitly derived from the goodness of its Creator which can be known (even if imperfectly) by reason, they have completely ignored this and attack anyone who questions the status quo, and hearkens back to our roots as Protestants. It’s sad. Joseph, I’m not sure what you’re asking, but I don’t think that Luther or Calvin had the kind of conversion experience that Jonathan Edwards demanded. That’s not a rule. But I’m not prepared to question their credibility because they didn’t have the experience. Omar may be my favorite character. He is President Obama’s. What kind of implications does this aspect of 2k (sufficiency of general revelation) have for apologetic methodology, if any? Nate, I’m sure it has some but since my partner at Old Life wrote the biography of Van Til, I’m not feeling free to explore them. I would say that one consequence may be that we can ease up on the Princetonians for their supposed epistemological naivete. I’ve read and enjoyed the biography but I don’t recall any analysis of Van Til’s thought with specific regard to 2k. Could you turn me to any sources that seek to reconcile the two? Nate, I’m not sure there is a good harmony but you should look at VanDrunen’s chapter on VanTil and his twin legacy – Bahnsen and Kline. It’s in the NL2K book. Once upon a time there was Christendom. Thinkers shared basic assumptions about God, man, and ethics. Though there were certainly variations within medieval philosophy, there was broad agreement on some basic ideas. So broad was the agreement that it was assumed that such notions were universal and undeniable tenets of natural reason. Natural reason, resting on those basic assumptions, proceeded without reliance upon special revelation. Perhaps Thomas Aquinas was the apex of this era; certainly he was a prominent example. Things changed, as they are wont to do. Maybe it was begun by Descartes with his â€œcogito ergo sum,â€ making man the starting point of inquiry. Whatever the cause and whoever articulated it, philosophy took on a different character. It took time, but eventually whatever could not be â€œprovenâ€ by this different starting point was questioned, doubted, and began to erode. Eventually it became problematic to know whether anything could be known beyond our perceptions (see Hume and Kant working this out). Ideas once assumed â€“ such as the basic assumptions of â€œnatural reasonâ€ â€“ were no longer shared, and no longer served as the basis for philosophic inquiry. For an example of a pretty wholesale rejection of the former assumptions of natural reason, consider Nietzsche. Rejecting God and rejecting traditional morals, some alleged him to be an influence in the formation of Nazi Germany. Of course he is much reviled. But was his thinking an evil aberration from natural reason or was it, in its own way, a brave and logical working out of principles that were present even back in the time of Aquinas? That is, was he just bringing to a logical conclusion the idea that there was a realm of philosophical thinking that did not have to account for special revelation? The former assumptions of â€œnatural reasonâ€ had disintegrated. Perhaps the fatal flaw was the idea of autonomous reason itself. Some reformed thinkers looked at the history of philosophy and were skeptical of how independent our reason can be, lest it end up dashed on the rocks of nihilism. Dooyeweerd said we should make our philosophical inquiries looking through the lenses (ground-motifs, actually) of creation, fall, and redemption. VanTil took a more radical approach, saying all of Christianity (including special revelation) was a necessary assumption upon which to base valid philosophical reasoning. You can see how some would think that a vigorous re-assertion of unabetted natural reason would be a regression to an unstable way of thinking that logically ends up with nihilism or some other school of thought inimical to Christianity. Michael, yes and no. Much of what you say make sense. And in the realm of philosophy it surely makes a lot more sense. Here arguably 2k’s biggest critics are of the philosophical type. But most Christians don’t live in the world of epistemology and ontology, or rather they do but never think about it. In which case, here I sit at a computer, hooked up to a modem, which takes me to Bill Gates knows where and I make a comment at Old Life. Or I walk outside my apartment, ride the elevator down 15 floors and greet a doorman who politely opens the door and says good morning. I then go on to the streets of Philadelphia and observe all sorts of institutions and enterprises, which are regulated by a city council and mayor that have no formal countenance of religion or faith. In other words, I live moment by moment in a world where I constantly confront reason unaided by special revelation working fairly well. It’s conduct that is not going to qualify anyone for church membership and won’t secure a line in the Lamb’s book of life. But it does work and does reflect order. Why won’t the philosophically minded leave the cave and see how real life works (and doesn’t)? DGH, you want me to just accept reality as it is? I have a couple books on that – let me read them and I’ll get back to you. In thinking of “Why won’t the philosophically minded leave the cave and see how real life works,” I am reminded of a dialogue of Plato – no, not the one with the cave, but one in which Socrates opines on the physical heavens. He didn’t use a telescope or make measurements; he simply philosophized about them because, in order for him to have unified thought, they had to be a certain way. So there is a desire for systematic thinking. Second, your request sound a lot like “why don’t you guys just not analyze everyday life.” But analysis – breaking things down – is what philosophers tend to do. Of course I have generalized. Alvin Plantinga, who did not fit nicely in my narrative above, would says you have a warrant to believe in your everyday sense perception, including the reality of your doorman. I’m sure that will make you sleep more soundly tonight. I assume you would agree with me that all of these readings of GR are defective. If I understand, you believe that we’ve gotten here by listening to the Enlightenment rascals — Hume, Kant, and so on. My question is, now that that cat is out of the bag, how do you propose to put him back in? All of these hypertechnical discussions about epistemology came about because people discovered that neither reason alone, nor reason plus sense experience, could always settle the difference between truth, error, and outright lie. What would you suggest in order to help them out? I believe that it was Horton who was cited here recently that if we return to the 1950s, we’ll get the 1960s all over again. Likewise: if we set our philosophical clocks back to the time when everyone agreed that “natural law teaches us that X” (if there ever was such a time), won’t we get the Enlightenment all over again? And haven’t 2k fans heard that The Lord’s Prayer speaks in favor of God’s heavenly will being immanentized? All kidding aside, this post makes a very serious point about regeneration. Well worth pondering. If we can take Romans 1-2 as an exposition on man’s reaction to God’s revealed truth (‘natural’ in terms of the revelation Gentiles receive, ‘special’ for the revelation given to the Jews), wherein man suppresses the truth as revealed by God. Besides many respectable ANE historians simply cite a lack of archaeological evidence to confirm 1-4, meaning that at this point we can’t absolutely prove or disprove these. In a sense the history presented in Scripture that has yet to be confirmed in he historical record simply isn’t falsifiable. Archaeology simply lacks evidence to confirm these events, it hasn’t disproved anything. Your presentation doesn’t do justice to the maximalist-minimalist debate in biblical archaeology. As a positive example of the continuing influence of NL, one only needs to look at the US constitution that is steeped in the NL thought. How else do we derive certain concepts such as social contract, and natural rights (which our own legal tradition asserts that these rights were endowed by God)? One could argue that certain human rights/civil rights movements are motivated by these same constitutional ideals. I am not sure that if the Constitution were written post-Kant that it would look at all like it does, simply because by the time we get to the 19th century NL & nat. theo. are (allegedly) debunked by Kant, Hume, et. al. That would make it incredibly ironic that many in the transformationalist camp are screaming for an originalist interpretation of the US constitution, yet these are some of the most ardent deniers of the applicability of NL. Without NL, our constitution looks nothing like it does, and that is fact. This doesn’t even touch an important discussion on the nature of ‘revelation’ in Scripture or in nature. Frankly, because of the anemic attention payed to natural theology in Protestant circles, most of us in the Reformed camp haven’t really dug into historic natural theology arguments here that might still be applicable in the current debate. Anselm, Ockham, Acquinas, and even Calvin’s approach to NL and it’s cognates needs further exploration. Frankly the current rejection of the concepts of NL and GR would have been scandalous in the eyes of the Reformers. While I need to look more into this to verify my suspicion, I’d be shocked to find a Reformed theologian pre-Kant that rejects NL & GR as a valid field of inquiry and highly applicable to the structuring of a civil society. I’ve got a little discussion on this over at my blog, where I am evaluating James Barr’s (OT Theologian) arguments in favor of natural theology as an important component within biblical studies. He seeks to expose the grave error on part of the dialectical theologians (Barth, Von Rad, Eichrodt, Childs) who ignore or flat out deny natural theology. While he doesn’t address the contours of contemporary conservative Reformed debate, there is shocking applicability to the reasons why some in the Reformed camp are so hesitant to embrace any form of natural theology. The fact of the matter is we 2-kers have a lot of work to do in this area in order to solidify our arguments against certain neo-Cal and transformationalist rejection of NL & GR. But this doesn’t mean that NL/2K advocates aren’t on the right track. Jeff, I’m not sure that gen rev. actually concludes all of those things. Secularist readings of GR do. But are you really going to say that no Christians believe some of these propositions? BTW, I’m not sure that believing in Adam or the Exodus are crucial for living peacefully and in good order. But, how is an appeal to SR going to help? How will SR put the genie back in the bottle? It looks to me this is where the theonomists have a point. You need to kill the cat. So once we left Kansas, I mean Israel, we were going to be living with competing truth claims. What’s the big deal? I’m not looking for the 1950s. I’m looking for the 0070s. Jed, you make a lot of interesting points, but I was simply asking: if GR is “sufficiently clear”, then why is it so clearly wrong on those points? Jed, you hint that the answer is suppression of God’s truth (to which I agree); so doesn’t that mean something about the clarity of GR? If I’m reading a sign and my glasses are all foggy, the sign cannot be clearly read, right? DGH, you suggest (in good Hodgian fashion) that it’s not GR that concludes these things, but secularist readings of GR. Sure, I agree. But what does *that* fact say about the clarity of GR? Anyways, I’m not going to press this here, because I interrupted MMann’s flow of thought. Carry on, folks. While the above understanding of the history of philosophy is not without plausibility in my eyes it is somewhat in tension with my observations and experience. The title of this blog entry is “Hi, I’m A Christian So I Can Be Trusted,” a title which reminds me of my policy of avoiding businesses that take pains to present themselves as “Christian.” I don’t know what it is about them – maybe they need to advertise like that because their competence is otherwise marginal, maybe my limited experience has been with outright hypocrites, etc., but I now avoid them. Then, whenever I have been involved with various evangelical groups (home school groups, “Christian” athletic organizations, etc. ), I almost invariably have at least one mind-numbing experience that makes me think there is something fundamentally wrong with evangelical thinking. So experience seems to tell me that the unbeliever is no worse off in the common things of this world and often seems somewhat better off. There – I said it. Now, admit it folks, I can’t be the first one to have thought this! Did I hear someone mutter “amen”? So I need to reconcile theory and experience. Or something. If GR is somehow vague or unclear as you say it is, then why does Paul use the language of suppression of the truth that ‘can be known about God is plain to them because God has shown it to them’ (v. 19), or why these are ‘clearly perceived’? I don’t think that this is a close reading of the text. It would also be curious as to why God deems men as ‘without excuse’ and liable to judgment if the information he gave them about himself as can be perceived in the created order, and as a result, the appropriate actions (worship, honor, etc.) should follow, if the information he gave was somehow deficient, or unclear. This under girds our whole notion of the Covenant of Works. If the current misconceptions of GR are attritbutable to anything, it is to the age-long suppression of the truth, not to the lack of good information, otherwise why would sinners be culpable at all? The fact is the denial or, willful ignorance, or suspicion of NL, natural theology, etc. is a newer trend of the history of the church. Now arguments from history aren’t going to solve the issue, but they might explain our current circumstances. NL needs to be justified on biblical and systematic theological grounds, as well as philosophical ones (I know that might not be the most popular sentiment currently). Exegesis obviously is the first-order priority, and if it can be demonstrated that Scripture, which we generally understand to be ‘special’ revelation as a whole, contains natural theology or even concepts analogous to this, then it doesn’t matter if some in the Reformed camp are suspicious, they will be ignoring their own cherished ‘special’ revelation to deny ‘general’ revelation. Philosophy will help to set up a historical context of how natural theology fell out of favor, and give cogent rational defenses of natural theology as it once existed and how it translates reasonably into our modern contexts. As an aside. there are also some in the Intelligent Design and even evolutionary camps who staunchly defend at minimum Theism. Some even maintain a belief in Adam, even if they don’t hold to him as the first human, they maintain that he is humanity’s elected federal head. Now, I think there needs to be better clarification and justification of these sort of views in order to be taken more seriously. But the fact that there is a majority of historians, scientists, and archaeologists, etc. that suppress, or even attempt to obscure the truth of God which can be clearly known by observing the created realm only serves to strengthen the point that the problem isn’t a lack of clear info, but it shows something more sinister and sinful is at play. Jed, I am willing to be convinced, but I don’t see how Romans 1:18-23 gets us to the common affairs of this world. What is it that is made plain? The text tells us the plain things are certain attributes of God, particularly his eternal power and divine nature. Because of the plainness of these things, men are “without excuse.” The text seems to be about leaving men inexcusable before God, not about the generic knowledge or competence of men. How do you build a bridge from this to generic natural reason? The link has information and some reviews with one by David VanDrunen (below). I’m guessing that ya’ll can ask DVD if he thinks it’s worth your time to read it. It’s also available at Amazon. Natural law was a common idea among the Reformers and their heirs. There has been some fledgling reconsideration of this heritage in recent years in my own Reformed tradition, and it is very encouraging to see similar discussions taking place among Lutherans. Natural Law: A Lutheran Reappraisal helpfully wrestles with natural law from various historical and theological angles and also explores its relevance for several important social and ecclesiastical controversies of the present day. These essays on natural lawâ€”some enthusiastic, some cautious, others skepticalâ€”are a wonderful contribution to the literature and should help to stimulate important conversations about this perennial issue for years to come. Jeff, why doesn’t your question apply to SR? What does the reality of Methodists, Roman Catholics, and Serbian Orthodox say about SR’s clarity? is protesting secularist readings of GR, not GR, could be doubled by pointing out that secularist and mainline readings of SR say the same, er, 5 points. And the influences of the Holy Spirit notwithstanding, deciding consciously between good and bad readings of SR does not appear to differ radically from how we decide between the same in GR. Given that we are limited to ectypal theology as creatures, I don’t see how this is a question of the relative certainty in one over the other. I assume you would agree with me that all of these readings of GR are defective…but I was simply asking: if GR is â€œsufficiently clearâ€, then why is it so clearly wrong on those points? Jeff, this all still comes back to where you (and all others who deny the sufficiency of GR) seem to be locating deficiency. Simply put, bad readings of clear texts (be they implicit texts or explicit) are the fault of the reader, not the text. You’re a teacher. When you teach a student that 7*3=21 and he keeps telling you it’s 25 it’s his fault, not the multiplication table. And when that student’s folks come in for a conference and want to know why doesn’t get it, do you really say that the multiplication table is defective or unclear, or do you try and locate what is tripping the student up in himself? Jed, I am willing to be convinced, but I don’t see how Romans 1:18-23 gets us to the common affairs of this world. What is it that is made plain? I hope I didn’t say anything that intimated that Romans 1-2 gives anything definitive about how GR might structure society. You are right about the fact that GR in this context has to do fundamentally with divine-human relations. To your question, Romans doesn’t necessarily get us to the affairs except by implication in the judgment sections where God gives man over to a whole assortment of unnatural desires and sins. One could argue that the litany of sins in 1:26-32 highlights nearly the whole moral law as expressed in the Decalogue, even though the Law isn’t mentioned. There seems to be a clear sense of culpability amongst these gentile sinners since Though they know God’s decree that those who practice such things deserve to die, they not only do them but give approval to those who practice them. In this sense mankind generally knows that there is such a thing as sexual propriety (26-27), and you could go on down the list as right to life (contra murder, ruthlessness, malice), honoring authority (contra dishonoring parents), truthfulness (contra slander & gossip) etc. and all these positive concepts should under gird not only divine relations, but also human ones. Historically speaking, ancient and modern legal systems still reflect many of these tenets. Why does Hammurabi, Rome, Greece, Persia, and Egypt and all of the most important ancient civilizations have a great deal, if not all of these elements in their legal system when they had little to no access to special revelation? There are stronger cases in other parts of Scripture. I think it fundamentally begins in the Garden and the ensuing Primeval History. Fallen humans have access to knowledge about God and their obligations to him, which they largely ignore, but they also have access to knowledge about how the world works in a structural, and cultural manner. They discover certain aspects of nature which enable them to grow food, herd animals, work with natural resources such as metal, build cities (see Gen. 4), and they understand innate moral principles which enable them to construct functioning cultures. All of this happens in the context of fallen humanity, and insofar as the biblical record indicates, they aren’t operating with special revelation like we do several millenniums later. There are good arguments that a good portion of Wisdom Lit. follows natural theological contours, even in the context of ‘special’ revelation. If anything, Wisdom has much to do with how man should live in this world. Heck, a good portion of Proverbs is directly attributable to Egyptian wisdom sources; Proverbs 22:17 -24:22 are likely borrowed, if not nearly entirely copied from the Wisdom of Amenemope (written sometime between 14th & 11th cent. BC). This portion of Proverbs is all about how to live well in the human sphere, unless the author of Amenemope was divinely inspired as a Scripture writer, we have to conclude that he came to write these by using his God-given faculties of observation, and reason. There are other issues I could get into tonight, but it is late. I’d be happy to clarify and justify my position. I am coming to believe that GR, NL and nat. theo. are concepts that aren’t only defensible by reason, but that they are biblically defensible and these concepts and categories, even if rudimentarily are utilized in the writing of Scripture. I am of the opinion that the modes and nature of revelation in scripture are diverse, and that it doesn’t necessarily fit nicely into some of the categories we use in our discussion. I think what has happened is that some commendably take a high view of Scripture, but for some inexplicable reason can’t connect that to a high view of revelation wherever it was found. After all isn’t “all truth God’s truth?” Unless we are going to contend that all truth is contained in Scripture, we must at the very least concede that there are other modes of revelation that should norm human behavior as well. Jed, I asked about Romans 1:18-23 because I have previously seen it used as a proof-text not only for the competence of natural reason but also for the kind of arguments we should make in the common realm. I don’t think it does all that. Having said that, I don’t think we need to find a silver- bullet-proof-text to establish that the unbeliever can be quite skilled, knowledgeable and, in a sense, wise in the light of general revelation. 16. Moreover, let us not forget that there are most excellent blessings which the Divine Spirit dispenses to whom he will for the common benefit of mankind. For if the skill and knowledge required for the construction of the Tabernacle behaved to be imparted to Bezaleel and Aholiab, by the Spirit of God (Exod. 31:2; 35:30), it is not strange that the knowledge of those things which are of the highest excellence in human life is said to be communicated to us by the Spirit. Nor is there any ground for asking what concourse the Spirit can have with the ungodly, who are altogether alienated from God? For what is said as to the Spirit dwelling in believers only, is to be understood of the Spirit of holiness by which we are consecrated to God as temples. Notwithstanding of this, He fills, moves, and invigorates all things by the virtue of the Spirit, and that according to the peculiar nature which each class of beings has received by the Law of Creation. But if the Lord has been pleased to assist us by the work and ministry of the ungodly in physics, dialectics, mathematics, 237and other similar sciences, let us avail ourselves of it, lest, by neglecting the gifts of God spontaneously offered to us, we be justly punished for our sloth. I bring this up not to initiate a debate on whether the Holy Spirit communicates gifts to unbelievers, but to point out that Calvin was so impressed by the attainments of unbelievers that he did not shrink from associating them with the Holy Spirit. To your main point, “that the unbeliever can be quite skilled, knowledgeable and, in a sense, wise in the light of general revelation.” I can’t agree more. The Calvin quote is fundamentally what those of us who advocate 2k/NL in its current iterations are arguing. GR, which is something God-given is given, as Calvin argues, through the HS, which animates human action, informing us if right and wrong (in spite of our fallenness), and enabling us to create stable, even if imperfect, cultures and civilizations. Scripture is on another order of revelation with the primary aim being salvation, worship, and the advance of God’s everlasting Kingdom. All this to say, I am not sure we are too far apart in our thinking regarding the issue at hand. Forgot to somewhere there, sorry. Jed, I don’t think we are far apart, at least to the extent that I have worked through this niche. I was just wondering if you (and others) see something in the Romans passage that I don’t see. I’m thinking of starting a campaign against collapsing multiple issues into one. I think I shall call it “Whip Conflation Now,” or possibly “Got Conflation?” Perhaps I’ll make an Emancipation from Conflation Proclamation. I think there are at least two issues in this discussion. First, can an unbeliever exercise competence, insight, prudence and brilliance? Of course they can. But anyone who denies that has gone off the rails on a crazy train. A second question, which is quite severable from the first, is whether that unbeliever *as a matter of theory* has a defensible position. A classic example here is that of the brilliant but atheist scientist. I can recognize his skill, personally benefit from his work, and enjoy his good-neighborliness while rejecting his thought-life as a theoretical, philosophical matter. As a matter of theory, I could say that it is inconsistent to believe in design without believing in a designer, to believe that a being randomly evolved being is be able to apprehend truth, etc. VanTil recognizes the gifts of the unbeliever but said that, as a matter of theory, the unbeliever cannot justify much of what he practices. I suspect this conflation causes a lot of dialogical disconnect. It looks like I had three different proposals on how to write that one sentence and forgot to eliminate two of them. You know what I meant. And, “Michael,” that is where I think the divergence seems to happen, between those content to have the unbeliever behave as if he believes in a designer behind the design and those who seem to think that justifying his practice matters. I don’t really care if the pagan can justify giving me correct change or telling the truth or protect my life, just that he does. It seems to me that it’s the epistomelogical emphasis that is behind the historical phenomenon mentioned in the post proper that kept unbelievers from being able to serve as jurors and civil servants. Michael, I agree that there are two issues here. The problem, though, is an abuse of common grace to explain unbelievers’ competencies. I have had plenty of interactions with seminarians of a world-view bent who think the only way unbelievers can exercise insight and prudence is by a dollop of common grace, some supernatural outside the body dose of divine presence to correct sinful realities. I myself do not like the idea of common grace for this reason — it is the trump card for explaining whenever an unbeliever does anything good — as if we evaluate believers that way, that little Susie only looks good in her Easter dress because of common grace. In other words, what inherent goodness resides in unbelievers after the fall, not in any kind of redemptive or meritorious sense, but in the sense that they are smart, able, strong, creative, etc. I’d argue they acquire these traits just as Christians do, through creation and providence (which common grace mucks up). Leon Kass is brilliant because he is smart and has studied and read and reflected in extraordinary ways. This doesn’t mean he is smart autonomously from God. God is the giver of all good gifts. But I’m not sure why we need to call the things we receive from creation and providence we need to call grace. Darryl, though I think I understand some of the reasons why the term developed, I have never been fond of the expression “common grace;” I’ve always thought “grace” to be inappropriate for anything outside the salvific realm. And why is it applied to an insightful book by an unbeliever but not an insightful book by a believer? It’s not like the believer writes an inspired book. Zrim, you said “It seems to me that it’s the epistomelogical emphasis that is behind the historical phenomenon mentioned in the post proper that kept unbelievers from being able to serve as jurors and civil servants.” I think you give way too much credit to epistemology. Law-making is a lot more like sausage-making than it is deduction from the ivory tower. Like so much of life, maybe it’s both, “Michael.” When I hear Bill Mahar suggest that Sarah Palin is unfit for civil office on the grounds of her religious views & practices I think there is likely at play both religious bigotry and the epistemological-impulse. And I can’t help but wonder if one begets the other. Hey, Zrim, are those quotation marks a sign of exactititude or a flash of attitude? Should I “Zrim” instead of Zrim? This note to me is staggering- here you have one of the most respected and brightest philosophers of his day (and from what I have read about him an extremely likable person) stating and admitting that his philosophy is futile. This is the type of despair that thinking without the common sense belief in God and His revelatory Word to humanity leads to. This belief in God is so natural to us (because God created us with this innate capacity which has been suppressed as a result of the fall of man) that it is like the sun shining, feeling the wind blowing on our bodies or breathing in air into our lungs. Riddlebarger states: ‘The problem is that philosophy has exceeded its rightful domain, calling into question the very Common Sense foundations of legitimate philosophical Inquiry. Reid comments: ‘In this unequal contest betwixt Common Sense and philosophy, the latter will always come off both with dishonour and loss…….. Common Sense holds nothing of philosophy, nor needs her aid. But on the other hand, philosophy (may I be permitted to change the metaphor) has no other root but the principles of Common Sense; it grows out of them, and draws its nourishment from them. Severed from this root, it honours wither, its sap is dried up, it dies and rots.’ Any philosophy which begins with reason (this is the definition of rationalism which turns out not to be rational) as its sole foundation and divorces innate common sense and knowledge of God from the thinking process ends in despair and futility. Riddlebarger continues: ‘Therefore, Humes skepticism can exist only as a sort of intellectual parasite, because in order to deny the Common Sense foundations of reason, the skeptic must use reason, in effect, without reason. The only way out of this dilemma, Reid argues, is to see that reason itself is not basic, or foundational, but that reason is part of something that is foundational in the faculty psychology of human nature.’ In other words, it is a gift given to us by our Creator. Yes, I get your point about how legislation evolves. But you said I’m making too much of epistemology. What I am saying is that if Green’s account suggests anything it’s that Bill Maher makes as much of it as 19th century America did. Which means he may not as enlightened as he thinks. One doesn’t need to believe in God in order to enter into legal agreements, bequeath property, file suit and testify to enforce their legal rights or serve as jurors, and witchcraft is no reason to suggest someone is unfit to run a country (political competence may be another matter though). Z-Rim, you are the most tenacious “turn-the-other-cheek” guy I have ever not met, but I am willing to doggedly defend the position that our present argument doesn’t matter very much. To wit: Maher is a nitwit. He wouldn’t know epistemology if he got broad-sided by a noumena driving a turbo-charged phenomena. I trust I have made myself perfectly unclear. Y-John, I hope to respond to you later today. “Michael,” the fundies Maher opposes wouldn’t know it either, but they are all still doing the epistemological shuffle. And that’s what really counts, doing it instead of understanding it. He opposes her politics so he plays the Constantinian card (“You don’t want someone who practices witchcraft with her finger on the button, do you?” was I think his phrase), just like the fundies (“You don’t want someone who thinks God is the smile on a dog with his finger on the button, do you?”). I don’t want either meeting me at the Table, but what’s any of it got to do with the Oval Office? But let me back up for a minute. It’s easy to belittle someone like Hume from a distance. He doubted his senses. He doubted cause and effect. Ha ha ha, what a moron, right? To feel the force of his position, though, you really need to actually read him and follow the progression of his thought. He was earnestly grappling with important issues and his persuasiveness is part of what drove Kant to greatness in his attempt to salvage what Hume was threatening. Like I said, there are many kinds of philosophy. Let’s go back to the scientist in his office, who seemed analogous to a philsopher lacking an off switch. On the contrary, it could be a philosopher who corrects the scientist. Dooyeweerd might say that naÃ¯ve/pretheoretical thought has an appropriate holistic nature (i.e., the wife as a whole) and that the scientist erred in taking one perspective (perhaps the modal sphere of biology) and absolutizing it by putting up pictures of cells. So there is no univocal way of doing philosophy. It can usurp other legitimate fields (as it does in worldview preaching, btw) but it does not do so inexorably. It’s a field of inquiry which can be helpful and shed light when kept within its limits. I am not sure but I think you missed the point of my post. Common Sense, as Reid defined it, is that gift “implanted” into every human mind by God at our creation. It is part of that image of God in man. It is also the part of our makeup which allows us to interpret general revelation which in turn makes us capable of developing a natural theology and a natural law through our natural reason. What makes this all confusing is that sin was also “implanted” into our consciousness or mind or whatever part of the internal human makeup you want to call it after the fall of man. This sin not only causes us to confuse our interpretation of the scriptures but also mixes up our interpretation of general revelation. We now have a propensity to suppress the truth of God in both nature (GR) and in the scriptures (SR). What is remarkable is that God, in his Providence, inspires some to be able to interpret general revelation with a developed natural reason for the benefit of many in the common culture we all participate in. That is a responsibility we all have, ie., to develope our capacities for the benefit of all in the common kingdom. 1. The existence of everything of which I am conscious. which I call myself, my mind, my person. 3. Those things did really happen which I distinctly remember. and are what we perceive them to be. 6. We have some degree of power over our actions, and the determination of our wills. 8. There is life and intelligence in our fellow-men with whom we converse. even to human authority in matters of opinion. a self-evident probability, greater or less according to circumstances. has been in similar circumstances. proposition is neither true or false. 4. Axioms in matters of taste. have a subject, which we call mind. b. Whatever begins to exist must have a cause which produced it. from marks or signs of it in the effect. Riddlebarger states: ‘This structure, while not profound, nevertheless gave Reid the epistemological framework that he needed to oppose the skepticism of Hume.’ Reid states: ‘Let scholastic sophisters entangle themselves in their own cobwebs; I am resolved to take my own existence, and the existence of other things, upon trust.’ And this trust is based on common sense notions that God would not play tricks on His creation and creatures but give us the ability to discern and know Him. In our fallen state we suppress this knowledge in unrighteousness (see Romans chapter 1) but with God’s plan of grace and redemption we more readily perceive His reality as we partake of the means of Grace and the Holy Spirit enlightens and illumines our minds through the Word of God and our particapation in partaking of the sacraments of baptism and the Lord’s Supper. Maybe you are thinking about common sense the way Thomas Paine defined it. I hope I made myself a bit more clear. I do agree with your last paragraph that there is a place for philosophical inquiry when it is kept within its limits. The thing is, John, that I have never met anyone fretting over Hume and needing Reid’s version of common sense. I have met people who have ridiculed philosophy in the name of the more common common sense. I get what you are saying- Christians do have to meet the challenges of honest intellectual inquiry. On the other hand, there is the problem of those philosophical types who refuse to see the evidence of Common Sense (Reid) and want to ridicule theological answers ad infinitum. So, it seems to go both ways. I guess one needs to develop the discernment and wisdom to know when someone is just playing mind games or when one is having honest intellectual questions which he cannot seem to answer one way or the other. As any good father would do with his kids he lets them find answers for themselves with a bit of guidance from himself. THIS is very very good. Except Jed appears to treat natural revelation and natural theology as the same thing. That’s as far as I read so far. I would have thought that Jeff would agree with this. THIS is very very good. Except Jed appears to treat natural revelation and natural theology as the same thing. That’s as far as I read so far. I am not sure I remember totally what I had in mind four years ago when I read this post – but at the time I was busy delving into the connections between General/Natural Revelation, Natural Theology, and Natural Law. This whole line of thinking was basically thrown out after Kant, and I was trying to figure out why this was the case, and why Reformed theologians over the last 200 years, for the most part either ignore or reject Natural Theology as a fundamentally Roman Catholic concept and toss out Natural Law along the way. The best I can come up with is that Natural Theology is more or less a response to Natural Revelation. God is revealing himself in creation (via General Revelation), and man responds by trying to understand that revelation through Natural Theology (NT). NT is not an infallible exercise, man has the ability to misunderstand what God is revealing in creation, however as Romans 1-2 makes clear is that Natural Revelation, and man’s theological reflections on it (NT) give a sufficient basis to make man reasonably aware of God and his demands upon men to establish their guilt, even where Special Revelation or Scripture is not present. Natural Law is the ethical outworking of Natural Theology, once man surmises truth about God, he can also sufficiently surmise what God requires. He has enough awareness to know what sort of behavior is acceptable to God – i.e. what his Laws are. Of course humans can, have, and do suppress these truths, and they obscure them – but that does not mean that such knowledge is unattainable, or that man will be not held accountable to what he ought to know had he not engaged in suppressing truth. What I didn’t say in my response above is that I reject the majority philosophical is-ought distinction. I think we can, even on the basis of fallen reason, observe from creation that there is a God, and as a result of his disclosure in creation we can know at least in part how we ought to respond to him. Of course, I could get into that more – but it is a rather lengthy discussion. I didn’t see until just now that you’d responded Jed. All kinds of definitions required here and yes, lengthy. I’m hopefully still on with Jeff. We’ll see, but if so, that will take priority.